A. Gardner Books: Lucky Leprechaun Giveaway Hop! I'm excited to be participating in the Lucky Leprechaun Giveaway Hop hosted by I Am A Reader, Not A Writer & Author Cindy Thomas. I feel pretty lucky this month because my very first cozy mystery was just released with Gemma Halliday Publishing. It was a blast to write, and I learned so much throughout the publication process. 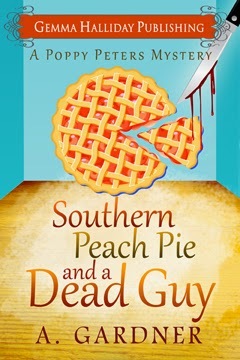 To one lucky winner, I'm giving away a $10 Amazon gift card & an e-copy of my new book, Southern Peach Pie and A Dead Guy!